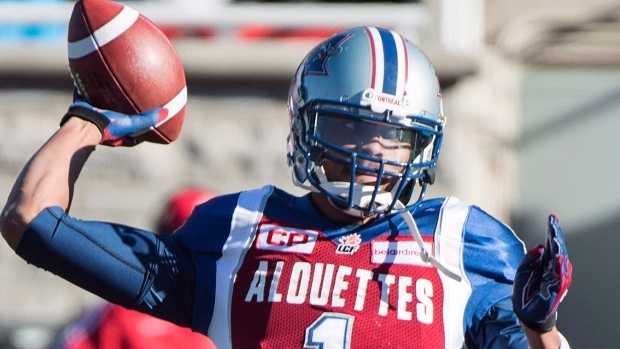 The Saskatchewan Roughriders could be adding another quarterback to the mix. TSN's Farhan Lalji reports the team brought in National pivot Brandon Bridge for a workout on Monday. A native of Toronto, Bridge received his release from the Montreal Alouettes on August 1. The Roughriders (1-5) already have four quarterbacks on their roster in Darian Durant, Mitchell Gale, G.J. Kinne and Vad Lee, as well as B.J. Coleman and Jake Waters on the six-game injured list. Bridge, 24, was a fourth-round pick in the 2015 Canadian Football League Draft out of South Alabama. He appeared in 15 games in his rookie season, starting one, throwing for 282 yards on 26-for-40 passing and two touchdowns. With the addition of Vernon Adams, Bridge was relegated to fourth-quarterback status behind Kevin Glenn, Rakeem Cato and Adams. After Adams returned from a concussion in late July, Bridge asked for his release, rather than remain with the team and take a pay cut. Bridge appeared in four games this season for the Als, all in short-yardage situations and didn't throw a pass. He rushed for two touchdowns and two yards on three carries. The Roughriders currently sit in the West Division basement and are coming off of a 35-15 loss to the Calgary Stampeders last Thursday. The team is next in action on Saturday in the back end of a home-and-home with the Stamps.